Para leer una versión de este articulo en español, click aquí. In the end, US immigration policy was not a policy at all, but a reflected status of vintage Cold War ideology that was not aimed at resolving differences effectively. The Obama Administration belatedly changed the policy toward Havana intentionally which meant to isolate Cuba from the rest of the inter-American community. This turned out to have the opposite effect, since Washington’s stance in isolating Cuba deeply offended the island nation’s neighbors. The White House’s myopic strategy did little to achieve its goal in aiding the Caribbean nation in saving the lives of innocent men, women and children as they embarked on their perilous journey to enter mainland US. This article has since been updated to reflect that Cuba has seen a reduction of trained medical personnel on the island as a response to the Medical Parole Program. Featured image: Obama and Castro in Havana. Taken from Wikimedia. [i] “Obama ending special immigration status for migrants fleeing Cuba.” The Washington Post. January 12, 2017. Accessed January 18, 2017. https://www.washingtonpost.com/world/national-security/obama-ending-wet-foot-dry-foot-policy-allowing-cubans-reaching-us-soil-to-stay-and-receive-residency/2017/01/12/21bbaac2-d912-11e6-b8b2-cb5164beba6b_story.html?utm_term=.4ca32f8e989d. [iv] Rt-mk, TeleSUR /., By Luis Gómez Romero et. al. “Obama Announces End to Cuban ‘Wet Foot, Dry Foot’ Policy.” News | teleSUR English. January 12, 2017. Accessed January 18, 2017. http://www.telesurtv.net/english/news/Cuba-US-Obama-to-End-Wet-Foot-Dry-Foot-Policy-20170112-0026.html. [v] Rt-mk, TeleSUR /., By Luis Gómez Romero et. al. 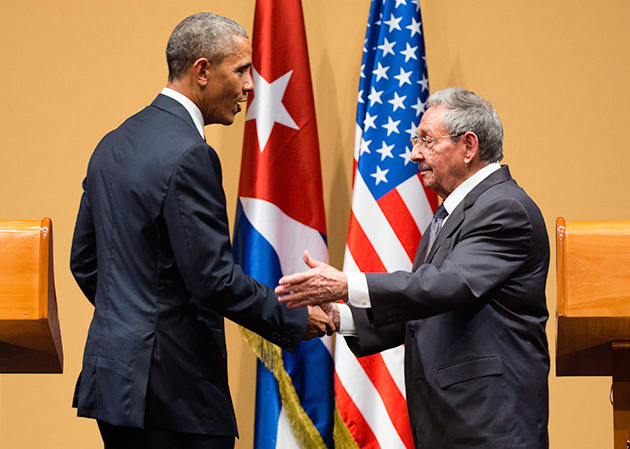 “Obama Announces End to Cuban ‘Wet Foot, Dry Foot’ Policy.” News | teleSUR English. January 12, 2017. Accessed January 18, 2017. http://www.telesurtv.net/english/news/Cuba-US-Obama-to-End-Wet-Foot-Dry-Foot-Policy-20170112-0026.html. [vi] Zengerle, Patricia. “Obama administration ends special immigration policy for Cubans.” Reuters. January 13, 2017. Accessed January 18, 2017. http://www.reuters.com/article/us-usa-cuba-immigration-idUSKBN14W2ZO. [viii] “Obama ending special immigration status for migrants fleeing Cuba.” The Washington Post. January 12, 2017. Accessed January 18, 2017. https://www.washingtonpost.com/world/national-security/obama-ending-wet-foot-dry-foot-policy-allowing-cubans-reaching-us-soil-to-stay-and-receive-residency/2017/01/12/21bbaac2-d912-11e6-b8b2-cb5164beba6b_story.html?utm_term=.4ca32f8e989d. [ix] “Obama ending special immigration status for migrants fleeing Cuba.” The Washington Post. January 12, 2017. Accessed January 18, 2017. https://www.washingtonpost.com/world/national-security/obama-ending-wet-foot-dry-foot-policy-allowing-cubans-reaching-us-soil-to-stay-and-receive-residency/2017/01/12/21bbaac2-d912-11e6-b8b2-cb5164beba6b_story.html?utm_term=.4ca32f8e989d. [x] “Obama ending special immigration status for migrants fleeing Cuba.” The Washington Post. January 12, 2017. Accessed January 18, 2017. https://www.washingtonpost.com/world/national-security/obama-ending-wet-foot-dry-foot-policy-allowing-cubans-reaching-us-soil-to-stay-and-receive-residency/2017/01/12/21bbaac2-d912-11e6-b8b2-cb5164beba6b_story.html?utm_term=.4ca32f8e989d. [xi] Zengerle, Patricia. “Obama administration ends special immigration policy for Cubans.” Reuters. January 13, 2017. Accessed January 18, 2017. http://www.reuters.com/article/us-usa-cuba-immigration-idUSKBN14W2ZO. [xii] Davis, Julia H., and Frances Robles. “Obama Ends Exemption for Cubans Who Arrive Without Visas .” New York Times. January 12, 2017. https://www.nytimes.com/2017/01/12/world/americas/cuba-obama-wet-foot-dry-foot-policy.html.